Now for those of you who don’t mind indulging, get ready for this ooey gooey double chocolate cake. It’s loaded with all the unwanted calories and delicious non-nutritional stuff you want to dig into, once in a way. I am sure you can see the pattern between me and chocolates. Yes, I love them and ever since I started trying to shed weight I have been eyeing these beauties from a distance. However, I like to be nice to myself and bake myself my monthly allowance of chocolate in as sinful a way as possible. So do try this one out sometime and trust me, no matter what you put in it at home it’s better than what you would buy outside. Moreover, its the perfect way to keep kids busy during rainy days (July is full of them). add the dry ingredients to the wet ones one tablespoon at a time alternating with milk. Add the molten chocolate to the mix and fold in. Bake at 180 Deg C for 35-40 minutes. 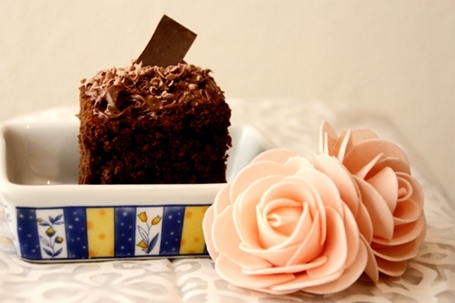 I have used Nutella for the frosting and garnished the cake with chocolate shavings and a chocolate wedge. This step can be done based on exactly how much chocolate you can relish at once. Fabulous ingredients and recipe you shared to make a good quality cake.s Thank you so much, you really very talented pewrson.